Fig. 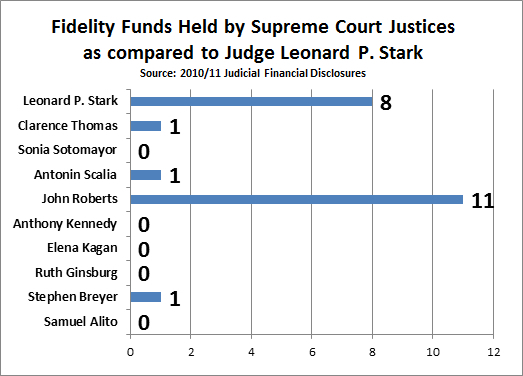 1—Chief Justice John G. Roberts, Jr., Financial Disclosure, 2011. Reveals investments in a range of Facebook interests, incl. Facebook, Microsoft, Mail.ru, LinkedIn, First Solar, T. Rowe Price, Goldman sachs, Morgan Stanley, JPMorgan, State Street Corp, UBS, Tesla Motors, Xerox, Zynga, Groupon. Click here to download a PDF. (June 10, 2012)—OpenSecrets.org just published new judicial financial disclosures. This is the first opportunity to scrutinize the holdings of the Supreme Court justices in relation to their refusal to grant Leader Technologies’ petition for writ of certiorari (appeal) in Leader v. Facebook. An analysis of each justices’ holdings is underway, but given what we have discovered already, this is going to be another sordid chapter in the Leader v. Facebook judicial corruption scandal. Chief Justice John G. Roberts, Jr. had what can only be considered massive conflicts of interest. This means he should have disqualified himself. But instead, he silently denied Leader’s petition. Now we know why. Just one of his holdings, Fidelity Contrafund, is currently generating him a 15.3% annual return. This fund is notoriously invested in Facebook, as this article describes “Fidelity Invests $74 Million in Facebook & $82 Million in Zynga,” BostInno, June 2, 2011. Another holding in T. Rowe Price has also been heavily publicized: “T. Rowe Price Invests in Facebook.” The Wall Street Journal, Apr. 16, 2011. In fact, T. Rowe Price's Facebook holding based on their $190.5 million investment was so large it was a required disclosure in Facebook's public offering documents. "A judge should inform himself about his personal and fiduciary financial interests"
"A judge should avoid impropriety and the appearance of impropriety"
"ROBERTS: ...If confirmed, I would resolve any conflict of interest by looking to the letter and spirit of the Code of Conduct for United States Judges . . . the Ethics Reform Act of 1989, 28 U.S.C. § 455, and any other relevant prescriptions." "ROBERTS: ...Well, I don't think special interests should be allowed to lobby federal judges." "KYLE: ...Judge Roberts, I expect you to adhere to the Code of Judicial Ethics." On threats to the rule of law, "ROBERTS: ...The one threat I think to the rule of law is a tendency on behalf of some judges to take that legitimacy and that authority and extend it into areas where they're going beyond the interpretation of the Constitution." "ROBERTS: ...[The Soviet Constitution] purported to grant wonderful rights of all sorts to people, but those rights were empty promises because that system did not have an independent judiciary to uphold the rule of law and enforce those rights. We do, because of the wisdom of our Founders and the sacrifices of our heroes over the generations to make their vision a reality." "ROBERTS: ...I became a lawyer, to promote and vindicate the rule of law." Here is what Judge Roberts did in Leader v. Facebook. The following table summarizes Justice Robert’s holdings with direct ties to Facebook that indicate bias and at least deserved disclosure before he ruled on Leader v. Facebook’s petition. It should also be noted that Judge Roberts is yet another Harvard graduate and former editor of the Harvard Law Review, as were Barack Obama and Thomas J. Kim. As SEC Chief Counsel, Kim gave Facebook a 500-shareholder rule exemption that opened the investing floodgates to $$$ billions in dubious Russian investments (Roberts holds stock in one of them, Mail.ru). Kim's former law firm Latham & Watkins LLP represented James W. Breyer, Accel Partners LLP. Judge Kimberly A. Moore's husband Matthew J. Moore how works at Latham & Watkins LLP. Other Harvard graduates in the Facebook cabal are Goldman Sachs' Lloyd Blankfein; Accel Partners' James W. Breyer, Ping Li and Jim Swartz; JP Morgan's Jamie Dimon, former Obama bailout director Larry Summers, Facebook COO Sheryl Sandberg, NY U.S. Attorney Preet Bharara, among others. Is it just me, or am I missing Justice Roberts' avoidance of impropriety? He said he believed in the "spirit" and not just the "letter" of the judicial ethics rule. That spirit (and case law) says, if it walks like a duck, and talks like a duck, even if you it is not a duck, back off and disqualify yourself. Source: John G. Roberts, Jr. (2011). Financial Disclosure Report for Calendar Year 2011, submitted 05/11/2012, published 06/07/2013. Shareholder T. Rowe Price, is a greater than 5% shareholder in Facebook. S. Hrg. 109-158. (Sep. 12-15, 2005). Hearings on the Nominations of John G. Roberts, Jr. to be Chief Justices of the Supreme Court of the United States. GPO Abstract | PDF | HTML Summary by Day. John G. Roberts, Jr. (2011). Facebook-related investments. Americans for Innovation. (Includes screen captures of the following Facebook-related companies who directly benefited from Justice Roberts' legal decisions in favor of Facebook in Leader v. Facebook: Accel Partners, IDG Capital Partners, Groupon, Zynga, Fidelity Growth Company K Fund, Fidelity Spartan 500 Index INST, Fidelity Contrafund Fund K, TR Price Prime Res Fund, TR Price SCi Tech Fund and Fidelity Low Priced Stock K Fund). S. Hrg. 109-158 (Microsoft, p. 136; Fidelity Contrafund Fund "K," pp. 127, 137; Fidelity Low Priced Stock "K" Fund, pp. 127, 137; TR Price Prime Res Fund, p. 129, 137; TR Price SCi & Tech Fund, pp. 128, 137). Gregory Gomer. (Jun. 02, 2011). Fidelity Invests $74 Million in Facebook & $82 Million in Zynga. BostInno. Mary Pilon. (Apr. 16, 2011). T. Rowe Price Invests [$190.5 million] in Facebook. The Wall Street Journal. Analyst. (Aug. 23, 2011). Facebook's expert witness [Dr. Saul Greenberg] practiced 'dark arts.' Origin of Facebook's Technology? If it walks like a duck, and talks like a duck . . . I see this blog is now censoring and deleting thought provoking yet critical comments? How remarkably ironic. We have no idea what you are referring to "Mr./Ms./Mrs. Craven." Perhaps those who live in glass houses should not throw stones. We have confirmed multiple times that Facebook is censoring private messages discussing this scandal. Even if we did, wouldn't that just be poetic justice? Why should you enjoy transparency while dishing out censorship? We, on the other hand, have not censored any of your comments. Ask one of your hackers to check your browser settings. LOL. Ha ha ha. That is rich. Then I'm sure you won't mind my reporting the comments you "didn't" censor. There is no conflict. I have yet to see a SINGLE instance of any judge here having a financial interest outside of mutual fund holdings. And for the record, I have absolutely no affiliation with Facebook. But I call them like I see them. I don't see Facebook or its attorneys spreading misinformation and wild conspiracy theories on blogs and in news outlets. If they were, I would be just as candid. Your statement is illogical. This blog has just PROVEN from public data a DIRECT connection between Chief Justice Roberts and Facebook's Gibson Dunn LLP attorney, Thomas G. Hungar, and yet you stick your head in the sand. The Facebook cabal works at every turn to label hard facts as disinformation and misinformation. No wonder sales of Orwell's 1984 are through the roof. Your blindness epitomizes doublespeak. Your belief in a lying, thieving, immoral, amorphous organization of self-confessed hackers is precisely why history repeats itself, and why societies collapse. Save yourself. Yawn, Facebook's modus operandi is to accuse others of the things they are doing to get their targets chasing shadows instead of staying on task to expose them. Don't fall for it. This is my first time I have visited your site. From the volume of comments on your posts, I guess I am not the only one! keep up the great work. We are IFC Investment group United Kingdom.We have tie with top UK banks that champion the opportunity of providing financial services to clients worldwide. For many years, we have built a reputation for expertise, professionalism and results! We offer specialized services to borrowers, students, career explorers, workers, businessmen, bankers,traders,importers and exporters with or without existing capitals. We provide success-fee based consultations . Clients get advice specific to their situations, as well as connections, information on timelines, costs and chances of success in their financial needs. We also open LC for our clients for their import businesses. We issue both lease/sale BG/SBLC through AAA rated banks in the world. We also monetize financial instruments.